So why did I choose cloth diapers over disposables? Let me list the ways. 1. Good for the environment – It is no secret that disposables take years and years to decompose. I once read an article that when viewed from the sky, the Pacific rim is lined up with disposable diapers waiting for years to decompose. Realizing that I will be a Mom soon and I’ll have to clothe my child, I can’t bear to think that I’ll be contributing to this universal problem on waste management. So dito pa lang, sold out na ako to use cloth diapers. 4. 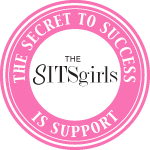 Potty Training will be easier – In one of my reading sessions, I learned that cloth diapered babies will be easier to potty train. I actually didn’t put high expectations on this one because I didn’t want to stress myself with potty training. I figured I won’t train Lyndel until I think he is ready. To my suprise, I discovered October of last year that Lyndel had already been potty training himself! I didn’t even get to buy him training pants anymore. He just removes his diaper when he fee’s he is about to pee or poo and goes on searching for his potty. What can I say? I guess this is one the benefits that just happen naturally, no need to even work on it. So there, if you’ll ask me if I’m a cloth diaper advocate, my answer is a big YES!!! I recommend it to all the families out there! 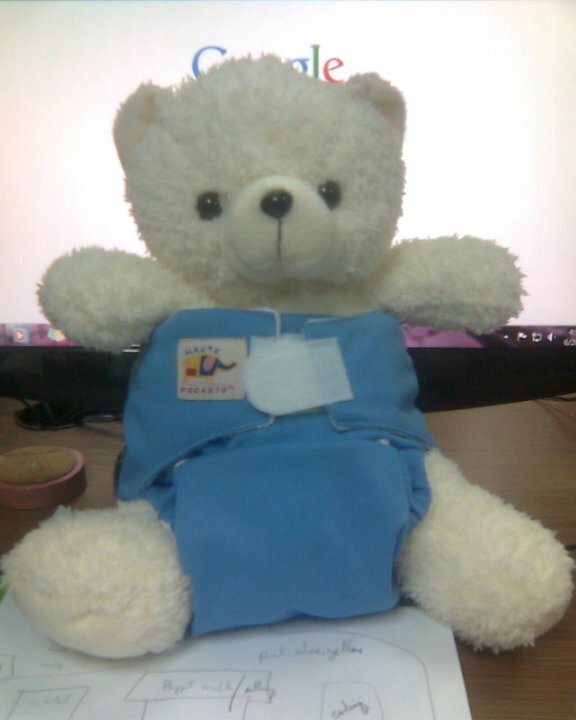 Back in 2010, I even had to fight for it because the people around me thought I was being a silly and frivolous pregnant girl. Well, I’m glad I stuck with what I believed in. That’s Momma power for you! 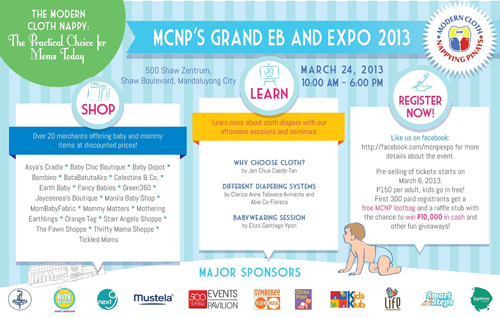 To know more about the cloth diaper movement and to meet like-minded Moms, join the MCNP’s Grand EB and Expo on March 24! wow dami mo nang nasubukan. ngayon ko lang narinig yang rocky mountain. Hi Jen! I also had that fear, hahaa, sa sobrang cute ng designs, ayokong madumihan. hahaha. I even dreaded the breastfed baby poo when Lyndel was still a newborn just because ayoko madumihan ang diaper. dami mong na try pala. kami we tried alva. we liked it and eventually stuck to it. uu, parang wala na yung brand na yun. Inisa isa ko lahat ng online stores dati eh. wala naman akong nakitang ganon brand.